But only if you're serious about changing your life, having the skills to protect yourself and others, and having the confidence, power, and control of a true Master Warrior. Ninpo-Mastermind, online ninjutsu training program. Why should you enroll in this new program? I know that you probably don't know me. You don't know how I'm different from any other teacher or so-called "master" on or off the internet. You don't know how what I teach is any better than what anyone else is teaching. And I know that the only way to convey that difference is to "show" you. Talking about the differences isn't effective. Maybe you do know me, but you just don't have the time, financial resources, or ability to travel across the country or around the world to train with me. At least not yet anyway. ...from real, brutal, blood-thirsty assailants who want to beat, break, or kill you! And, not only do I believe that this program is going to change your life - I believe that it's going to really accelerate your progress towards Warrior Mastery! Not only do I believe it - I believe it so much that I'm going to do something that most teachers would never dream of doing. 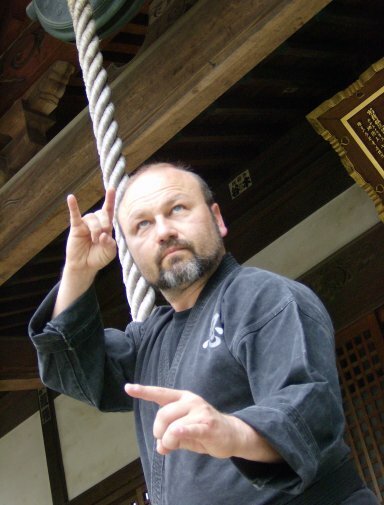 "Exploring The Power of Kamae"
just for trying the Online Ninjutsu Training Program! PLUS you get the first 14 days for just $4.95. PLUS... you get my 200% Money Back Guarantee. That's right - if you don't absolutely LOVE this training - just send me an email and I'll refund 200% (that's double your money back) of your payment for the Trial Program. To take advantage of this great trial offer, simply click the PayPal button to get enrolled for the introductory rate of just $4.95. ...I'm only an email away to help you with it! Remember, there is no set time limit for you to be in the program. Of course, I would hope that you would stay around, month after month, getting all of the great training lessons that I will be sending, but there is no obligation. You may cancel your membership at any time. Just send me an email before your next monthly tuition is due - tell me you want to quit, and we'll make sure that you are removed from the program. NOTE: The 200% Money Back guarantee is only valid on new Trial Offers. Once your trial period has expired, you may cancel at any time without owing anything more. There are no refunds or money back privileges after the initial 14 day Trial! If you do have to block (and I'll tell you when that should be), you will be able to do it without taking up a "karate stance" first - and you'll be able to hold off someone 2 1/2 times your size... ON ONE FOOT! How to draw, cut, and handle a real Samurai sword! How to deliver effective, knock-down, damaging strikes using many of the Ninja's "secret fists"
This will be your only opportunity to get this special offer, with this $397 high-level, bonus training program. Once you click away from this page, that's it. You will not see it again. To take advantage of this Trial Program and get your 2-week "Ninpo Mastermind" online training program trial for just $4.95, click on the PayPal button now to get started! After your 14 day trial period, you will be automatically billed $47 each month. Go ahead and enroll into this great online ninjutsu training program now! I will just figure this out on my own.